Have you tried this food? If not, you should! This is one of the best food in Penang. I don't have to tell you how delicious it is. You can ask some of the bloggers from KL like Aaronwoolala, Danielctw and so on. They tried and they wanted it so badly. 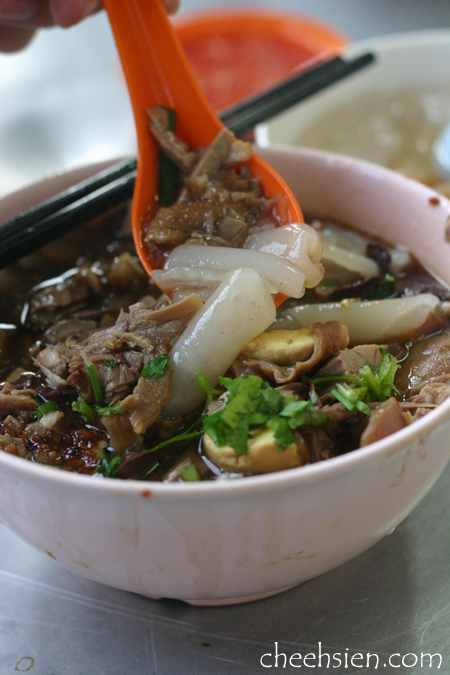 Too bad, there isn't anything near to this bowl of Koay Chiap aka Koay Zhiap in KL. I still remember my first impression to this food. It was like 2 years ago. I don't dare to try it because it looks creepy to me. Is dark and I can barely see what am I putting into my stomach. Well, good food have to try since my friend recommended and no harm trying. That goes my first bowl of Koay Chiap! There ain't any word to describe the delicious taste. As you can see in the photo, the overflowing chiap enhances the deliciousness. If you don't like the white thingy as in Koay, you can ask for rice or porridge instead. This hawker stall located at Kimberly Street, just a few streets away from KOMTAR. Business start from evening till sold out. Is a must try! You won't regret. Serious! Oh yes .. this is good food. Eh and very very nice, Koay Zhiap! I hungry can..... wanna eat again..